€100 for a ticket for Ireland v Netherlands at the Aviva Stadium next month. Sorry, but is that insanely high for a meaningless friendly? 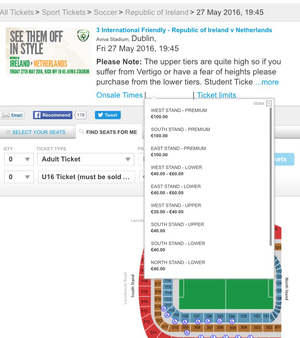 Posted in Misc and tagged Ask A Broadsheet Reader, Ireland V Netherlands, ticket, €100 at 1:51 pm on April 27, 2016 by Broadsheet.